Growth Habit: This evergreen tree is a native of mainland Australia. It grows between 4-14m in height making it one of our tallest weeds. The leaves vary from light to dark green depending on maturity. Type of Plant: A long-lived large shrub to small tree. Flowers: Scented creamy-white flowers form at the ends of stems in clusters during early spring. Fruit/Seed: The fruit are orange berries which ripen in autumn to winter and contain a sticky red seed. Dispersal: Reproduces from seed with the help of birds who eat the fruit then excrete the seed, giving the plant excellent dispersal reliant upon the birds range. 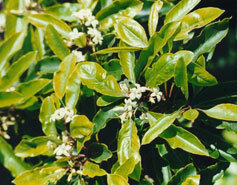 Distribution: An garden escapee which can be found in both disturbed and undisturbed bushland areas throughout Tasmania. Although very hardy it needs to grow where there is ample moisture available. Capable of invading and dominating bushland, and excluding native flora and fauna. Grubbing (spring). Seedlings and small bushes are easily removed manually. Herbicide (summer, spring and autumn). Glyphosate or metsulfuron could be used on larger bushes using the cut stump method. 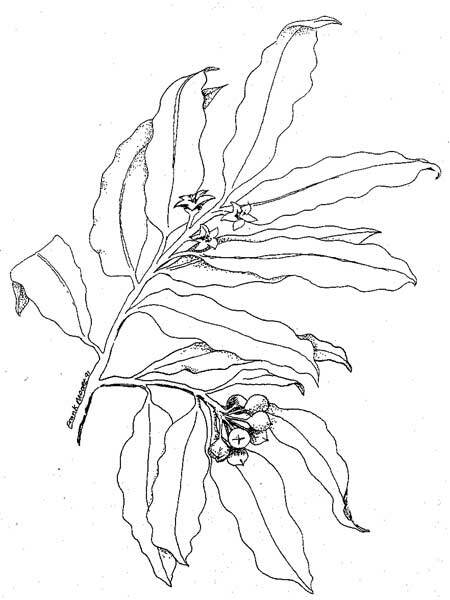 The stem injection or basal methods are also suitable techniques.